This morning, the Skerries Coast Guard team were tasked to investigate a report of a semi-submerged fishing vessel at Skerries harbour. 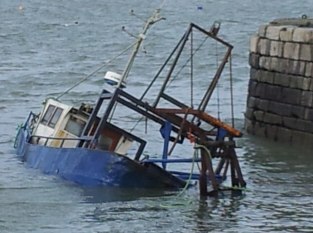 Following the overnight NW gales and rough seas, the boat had become submerged under several metres of water. The team checked the harbour area for any resulting pollution and thankfully none was found. The Dublin based Coast Guard helicopter made an aerial observation later that morning, again no pollution was reported. Remember – if you spot someone in difficulty, even if you only think someone could be in diffuclty, dial 999 or 112 and ask for the Coast Guard. This morning, the Skerries Coast Guard team were tasked to investigate a suspected pollution report near Donabate beach. A concerned member of the public had contacted the Coast Guard’s operations centre to report a large block of an unusual waxy grey substance on the beach. The size of the substance was approximately 0.25 cubic metres. As further information was received from the caller at the scene, the Coast Guard determined that the substance was likely to be ambergris, a naturally occurring digestive substance secreted by certain whales. This substance poses no danger to humans. A request was made for Fingal County Council to attend the scene and remove the item from the beach. 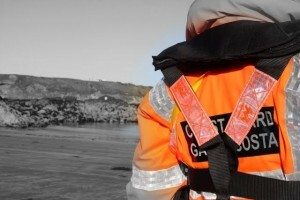 Remember – if you spot something unusual on the beach, dial 112 or 999 and ask for the COAST GUARD.